The Belly Dance Flames have been performing together as a dance company headed up by Salise Pearson since 2005. Based in Matlock – the dancers come from all over the Derbyshire District and meet regularly on Wednesday nights to practice their routines and most of all enjoy each other’s company. Our dancers are of all age groups, from 20 to the over 50′s. We also pride ourselves on being individuals with our own unique styles. The Flames dance style is based on Egyptian Belly Dancing combined with elements of Turkish, Lebanese and various other dance styles! The Flames have recognised that combining traditional belly dance with other more International dance trends allows them to add elements of diversity and humour into the performance which audiences seem to appreciate. 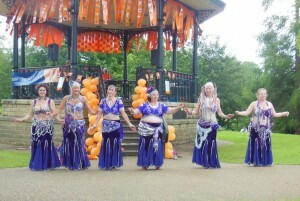 Our dance style is varied and we use a range of dance props including swords, veils, fans, dance canes, tambourines, and Isis wings.We choose traditional and contemporary music for our dancing and use dances with Egyptian, Turkish, Tribal, Arabian, Flamenco, African and Far Eastern influences. 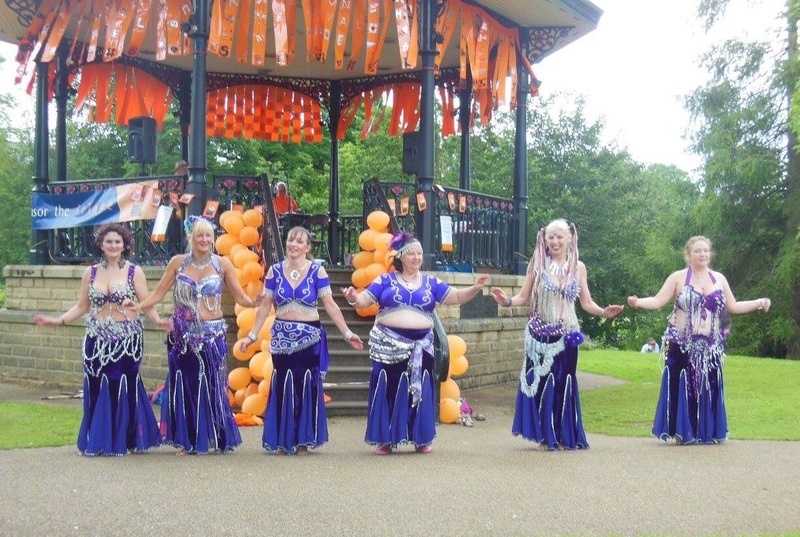 Throughout the past year Belly Dance Flames have been extremely busy performing at events such as The Buxton Fringe Festival, the annual Day of Dance at Sudbury Hall and various Dance and Music Festivals. The Flames raised nearly £1,000 in October last year in Aid of The Alzheimer’s Association and in September 2012 we put on own production “The Magic Turban” at the Guildhall Theatre in Derby The Flames are a non-profit making organisation who put all money raised back into costumes and props enabling them to put on fabulous shows throughout the year. Salise the Flames founder and mentor has had an amazing career combing her day job – Nursing, with her ultimate passion of performing dance at a professional level throughout the UK. Her knowledge, experience and overwhelming enthusiasm has encouraged many dancers to achieve goals well above their own expectations. Some students have gone on to be teachers and professional dancers within their own right others continue to just enjoy the freedom and friendship Belly Dancing offers to all women alike.